Games made me do it! 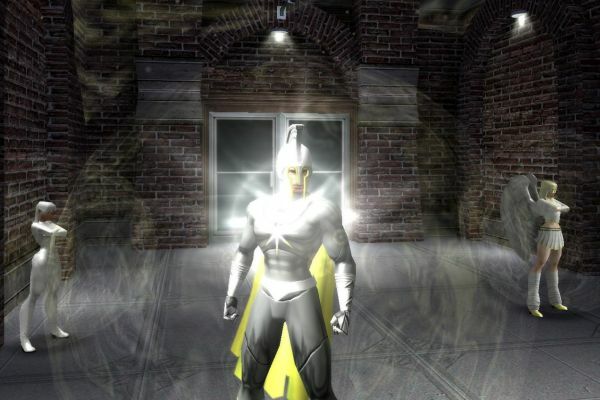 Screenshot from City of Heroes, starring my character In Hoc Signo Vince (a modern paladin type with a Roman-inspired helm and Valkyrie cape), leader of the supergroup Masshiro (“Pure white” in English) on the main European server. In the background two other supergroup members. Evidence to use against me if someone here in Mandal blows up something. Evidently it must be divine intervention that I have not already murdered several times over as many people as Mr Breivik. Well, I won’t deny that. Divine intervention is a good thing. (Somewhat depending on the deity, says a voice in my head.) But if so, I think we should not rule out demonic intervention in his case. Or “mind parasites” as we say in the Transdimensional Church of the Cosmic Raccoon. Evidently computers must be a lot more widespread in Afghanistan than their $1 a day average income made me believe. Also, those games must be older than I thought to have influenced not only Hitler but also Genghis Khan (probably Civilization II in the case of Genghis, the Mongol Horde strategy was a pretty sure winner back then). Not to mention the Vandals, the Aztecs, and the Assyrians with their habit of stacking up skulls. Incredible how the amount of computer games has dropped over the last few decades to give us the fairly peaceful and harmonic world we have today, compared with every single age of recorded history (and the bone record of prehistory, implying that something like a quarter of the stone age dead were killed in some way). Oh well. I should probably go set some pixel people on (spiritual) fire again. After all, I am not like you ordinary people who don’t do such dubious things as playing games! Incidentally, the word “masshiro” is Japanese, as is the costume of one of the girls. It refers to all of us using light-based powers, as a symbol of spiritual purity, and has nothing to do with race. Â Yeah, right, tell that to the judge! This entry was posted in games, human mind, politics by itlandm. Bookmark the permalink. There is always some excuse. I’m sure there are some kids (like mine, I sometimes fear) who have been exposed to violent games, like first person shooter games and such, without parental supervision INSTEAD OF playing outdoors, reading books, etc. But if someone is geared towards violence, they’ll find violent games and books to read. If one’s mind thirsts for evil, it can be found in everything. If one’s mind thirsts for good, it can be found in most things. Or so I believe, at least. Yes. It is obvious that what this profiler has found is a correlation, not a causation of games causing crime. She probably said as much, but that would not sell. And even that is tenuous at the least. There are probably millions of people playing violent games, from Angry Birds to Age of Conan, and only a handful of them become mass murderers. And it is utterly impossible to predict on the basis of what games you play whether you are (or will become) a criminal. So it can at the very best be used to rule out the genuine saints. Evidently I am not yet one of those! I see my Angry Birds more as little demolishing tools, although after a while the pigs do become annoying and it is somewhat pleasant to blow the stupid smiles off their faces (and their faces off their faces, for that matter). I don’t play it much because it’s just more of the same game with somewhat better tools as you go along, but . . . I suppose some people would do it for the pig-murdering value instead of the utilizing-tools-to-accomplish-a-goal value. The more I think about it, the more I hope (and think, thankfully) that I am not one of the pig-murdering sort!